There’s a new display that’s hard to miss as you walk through the gallery of the Mexico pavilion. Discussing the calendars of Mesoamerica, there is a scaled-down, but still massive, stone calendar present in the center of the room. The question is, what is the stone constructed from, what was it used for, and what does it tell us about life among the Aztec? Luckily for us, Epcot’s Mexico Pavilion doesn’t leave its guests with these burning questions! 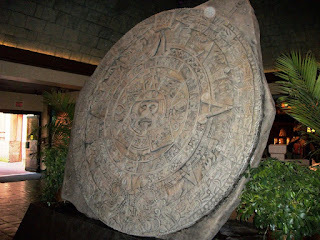 “The Aztec Calendar Stone was carved from basalt, or solidified lava, in 1479. Dedicated to the sun god Tonatuih, it is a massive carving at three feet thick, almost 12 feet across and weighing almost 25 tons. It was once painted in bright colors like all Aztec sculpture and displayed on or near the main pyramid of the Templo Mayor in the city-state of Tenochtitlan. “For centuries the Calendar Stone was lost and buried face down in front of the Spanish municipal palace in present day Mexico City. The massive carving was discovered on December 17, 1790, during removations to the central square, or Zócalo, and quickly became one of the world’s greatest archaeological finds. “The carved stone is a brilliant combination of artistry and geometry and illustrates the Aztec’s understanding of time and space as wheels within wheels. The intricately carved surface of the stone combines their understanding of the calendar as a cycle of time integrating observations of the sun and stars, including the constellation represented in two images of the fire serpent framing the stone. It is not completely understood how the stone itself was used, but it may have been a monument or possibly a sacrificial altar. 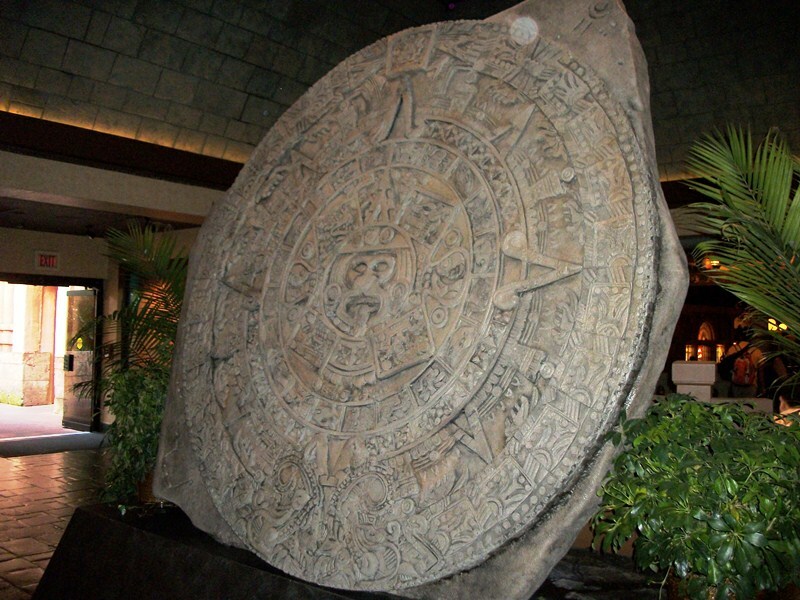 “Most scholars agree the calendar stone represents the Aztec view of the cyclical nature of creation and destruction, with the four previous world ages – Jaguar, Wind, Rain and Water – followed by Sun, the fifth or ‘current’ age, representing the Aztec World.